When the occasion is all about love, can flowers be far behind? 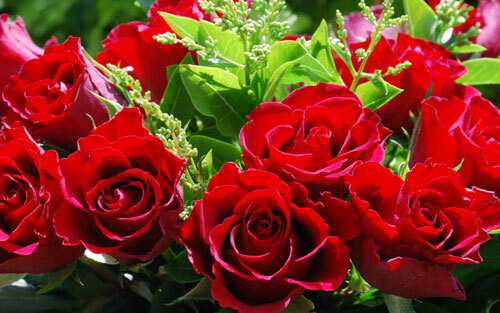 Flowers form the most beautiful item to express your love with, and is an indispensable gift for Valentine's Day. 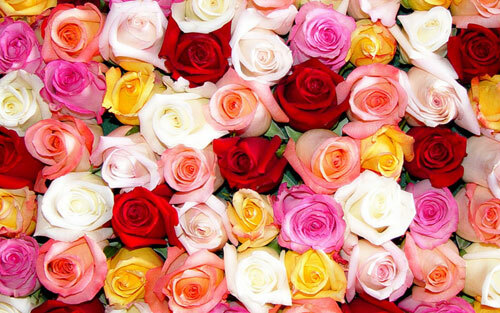 The rose wins hands down as the most popular flower for Valentine's Day. Roses of different colors carry different meanings and messages. Know about the association of different roses with Valentines Day and what color you should pick to gift to your dear ones on the occasion. If you enjoy reading this article on Valentine's Day Flowers, click here and forward this article to your friends. Happy Valentine's Day! It is difficult to say how and when the use of flowers began during Valentine's Day celebrations. Fresh flowers have always been seen as an embodiment of beauty and the use of it as a gift item is regarded as an expression of the beautiful wishes that reside in the heart of the giver. We can only conjecture that the incorporation of flowers into the Valentine's Day festivities began with the same intention. Bouquet of Yellow and Orange Roses: Passion. Black Roses - "Adios" or "It's Over"
The most popular Valentine's Day flower is however, the red rose. The mythological significance of the red rose, that of it being the favorite flower of Venus - the Roman Goddess of Love and Beauty, makes it the perfect blossom to be gifted to someone you love passionately. The red rose is an indisputable first choice for lovers, not only for Valentine's Day but also on other occasions. The practice of gifting red roses on Valentine's Day is believed to have become popular with the introduction of the Persian tradition of "the language of flowers" to Europe by Charles II of Sweden in the 16th century. This was given a further boost by several poets and authors of that age who praised and promoted the red rose as a symbol of love, passion and beauty. According to popular legends red rose is considered to be a favorite flower of Venus - the Roman mythological Goddess of Love and Beauty. Hence the red Rose came to be associated with love and romance. Historians believe that the tradition of giving red rose on Valentine's Day became popular in the 1700s when Charles II of Sweden introduced the Persian custom of "the language of flowers" to Europe. Books giving details about meanings of particular flowers were published which demonstrated to people how entire conversations could be carried out using just the flowers. Poets and romantics at heart also eulogized red rose as a symbol of love, passion and beauty that helped to create strong association of rose with love and Valentine's Day.